There’s a diner in town for all your brunch plans and hunger pangs. It’s called The American Connection Diner and it has the vibe of an 80s American diner. They’ve got a big menu with scrumptious food options. Movie wallpapers, the neon sign out front, pretty hanging lights, the old school flooring and furniture (there's a swing, too)—American Connection’s got the ambience on point. Whether it’s a breakfast scene or post work comfort food, you’ll be delighted with the American Connection experience. 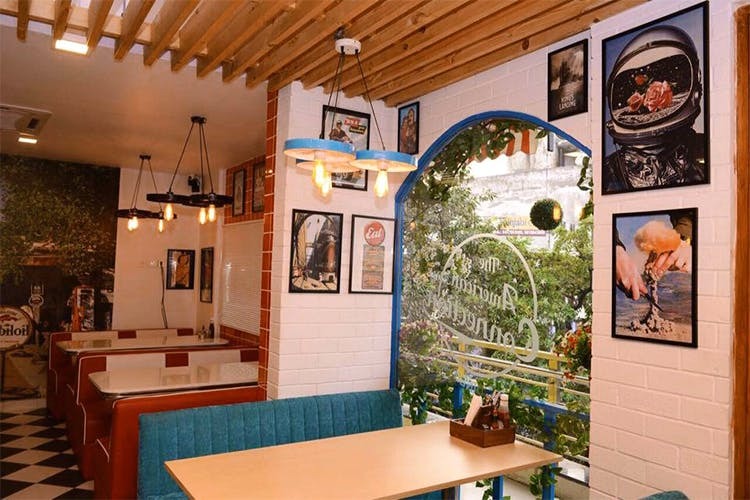 When you delve into the food, you’ll find monster pizzas—they claim to have India’s biggest pizza that are as big as 34", btw, giant burgers, cheesy pull apart sandwiches, the works. They’ve got some 20 pasta variants, a chocolate pizza (mixed feelings about this), and the trendy pizza-in-a-cone coming soon to the menu. You’ll find your favourite mocktails, smoothies, shakes, and hot beverages to sip on (the watermelon jalapeño cooler sounds insane). And to end your meal on a satisfactory note, they’ve got desserts, pancakes, crunchy waffles and the likes. Try their Cheese Lava Burger, Peanut Butter Brownie Shake, and Peri Peri Fries.